The Skowhegan restaurant's owners gave the McCarthy family, the previous owners, the old window with their name on it that hung for 33 years. SKOWHEGAN — When the late Richard McCarthy Sr. bought a vacant, five-story former grain mill on the banks of the Kennebec River in 1984, his idea was to convert the old place into a restaurant with a lot of character. He called it McCarthy’s Old Mill Pub. At the front door off Water Street, McCarthy installed a colorful, stained glass window with the name of the establishment spelled out in glass. Fast forward to Monday, when members of the McCarthy family met at the pub with members of the Dore family, who bought the place in 2012. 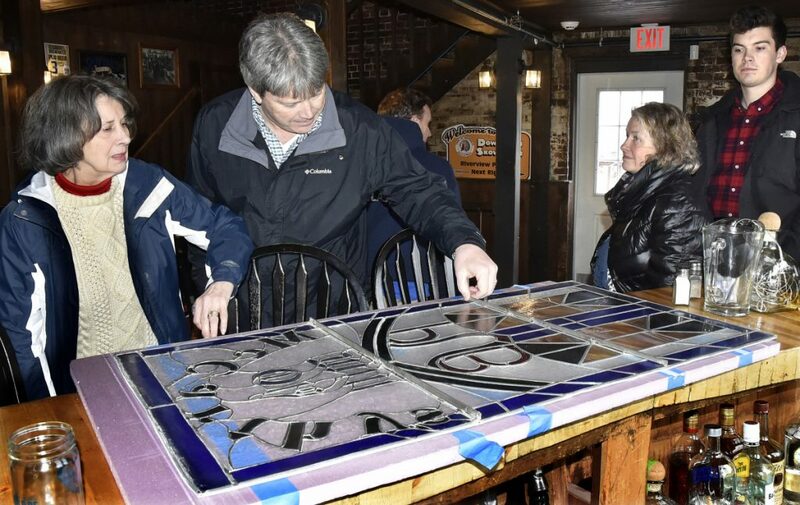 It was a stained glass swap — the McCarthys would take the old 47-by-25-inch window, and the Dores would install a new one with the same dimensions and their own name on it. The Dores LLC, which owns the pub, is made up of Greg and Paula Dore and their sons. Greg Dore is also Skowhegan’s road commissioner and chairman of a group proposing a whitewater rafting park in the Kennebec River Gorge through downtown Skowhegan. Rick McCarthy, of Pittsfield, his mother Judie, of Skowhegan, and her grandson, Kael McCarthy, were on hand for the switch Monday morning before the pub opened. The building was constructed in 1909, first as a working grain mill, then, possibly, a rug manufacturer before becoming storage space. At one point there was talk of tearing the old mill down, but McCarthy said his father secured state historic preservation funding and restored the building, which sits on rocky ledges high atop the north channel of the Kennebec River where it merges with the surging waters of the south channel at Weston Dam to form the Kennebec Gorge. 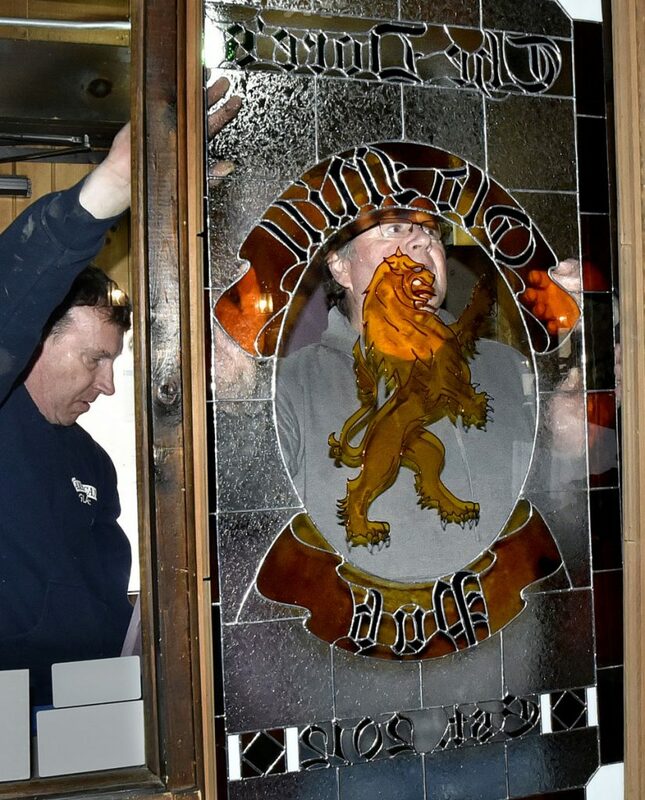 Eric Dore said they understand the McCarthys wanting the stained glass window with their name on it, so they commissioned the new window with bearing their own family name. He said they were happy to give the original window to the McCarthys. Julie McCarthy, Rick’s wife, said the old window will be installed in their home in Pittsfield. The new window, made by Laura McCarthy — no relation — of Maryland, has orange and Kelly green sections with navy blue, white and rustic gold. The Dore name is in a banner marked with a large gold lion, like the one displayed on the front, outer wall of the building.